Maple Gate Freight has an extensive fleet of vehicles to place at your disposal. No matter what the size of the shipment or the destination, Maple Gate Freight will pick it up and deliver it on time, every time, anywhere in North America. Dry Vans are perfect for cargo that is not sensitive to temperature changes and come in a variety of lengths to meet any need. Reefers are climate controlled and are excellent for moving produce, pharmaceuticals or other perishable products. Flatdecks are ideal for moving large heavy freight that just won’t fit in any other kind of container. With careful route planning a Flatdeck can move almost anything to almost anywhere! Dropdecks make loading and unloading simpler by bringing the cargo closer to the ground. This means that you don’t necessarily need a loading dock or specialized facility to get your freight on the move. Rack and Tarp transport can handle anything that can be physically fit on the trailer and be strapped down. Safe, secure and easy to load or unload, the Rack and Tarp system is the ideal choice for many logistical efforts. Rolltite is used in a variety of cargo hauling roles- usually where the added space and weight of a rigid container shell would be a liability or where quick and easy access to the freight is needed. Super B Vans and Flatdecks are the heavy hauling equipment of choice for many industries. If it can sit on the trailer, a super B or flatdeck can move it. Whatever your requirements are, Maple Gate Freight has the right vehicle, in the right location to take care of you. Contact us today to learn more about how we can take care of your logistical needs. 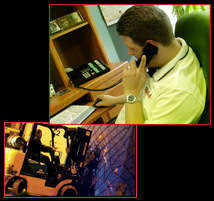 Equipment | Maple Gate Freight Systems Inc.